Your tiny little baby that’s growing by the day has got to that point where they’ve outgrown their baby bath, how did that happen? They’re sitting up now, or perhaps the space is becoming too confined for their splashing and kicking, either way the next natural progression is moving them to the family bath. When a baby bath has provided the comfort and safety that a baby needs, how do you accommodate for that when moving them to a family bath which will seem massive to them in comparison? Whatever their age, a little one needs to be provided with a safe, secure and happy bath time environment which will ensure that they continue to enjoy their bath time routine. Here are our top tips to help make the perfectly natural transition to the family bath as smooth as possible for you and your baby. When transitioning to the family bath make sure you are with them every step of the way. They’ve probably grown to love bath time by creating happy and fun experiences in a baby bath so make sure you replicate the same in the family bath. Provide reassurance and comfort to them, and whilst you certainly don’t want to depend on it to make them feel secure you could even bath with them for the first few times to get them used to it. Always be on hand to provide support and never leave them unattended in the bath. We might be biased, but the easiest way to transition to a family bath is with a BabyDam. BabyDam allows you to create your own custom sized bath within the family bath, as your baby grows and gets used to the family bath you can position the BabyDam further up the bath to give them more room. A lot of our customers find that the BabyDam becomes synonymous with them at bath time and we have known customers whose children use it up until the age of 5! By using a BabyDam this gives you the option of sitting on the dry side of the bath which allows you to really provide the support and comfort to your little one when they need it most. 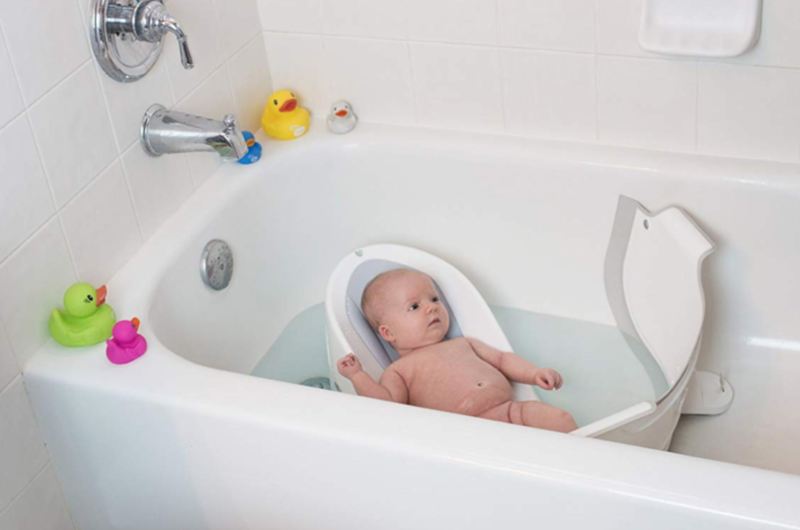 A bath seat or infant sling means that even if your baby isn’t quite sitting up yet but has outgrown their baby bath then they can comfortably begin getting used to the bigger space. Either can also be used in conjunction with a BabyDam, it can even be used with newborn babies meaning that you can get them associated with the family bath from a really young age. Even if they are sitting up, a baby seat can provide that additional bit of support whilst making them feel secure. You want to associate baby bath time with lots of fun and giggles and you can continue to do so by bringing plenty of toys to the party! Think rubber ducks, bubbles and washable crayons if they’re old enough to use them. Bubble bath will always provide a fun and happy experience, just ensure you use a baby friendly bubble bath. As always, every bath time needs to provide safety and security to your baby. Never leave your baby or child unattended in the bath, even if it is for a few seconds. Ensure the water is the right temperature and test it before you put them in, not too hot and not too cold for baby. If you’re worried about the bottom of the bath being slippery invest in some grippy dots or a textured mat that you can pop on the bottom surface of the bath. As those little hands start to investigate and their curiosity takes the better of them make sure that everything they could get their hands on is hidden away and out of reach, especially razors, plug sockets and toiletries. With the BabyDam, you can choose to position baby away from the pesky taps, but if they are using the entire length of the baby bath then either keep them away from the taps or invest in a tap cover to avoid them having an accident, believe me, there’s nothing more interesting than taps when you’re a child! By providing a safe and confined bath time experience for baby this will ensure the transition from a baby bath to a family tub is as smooth as possible. What are your top tips for this transition? Keep up to date with the latest news and competitions from BabyDam over on our Facebook page or Twitter!